There’s nothing worse than wanting to play golf but not being able to because of pain in your body. And that’s especially true when it’s a beautiful day out. Equally, it’s not much fun trying to hack your way around the golf course, just trying to make it in without too much more damage to your body. 1. Remove all unnecessary movements. 2. Excessive twisting and jerking. 4. Excessive use of the arms and hands. When you look at most swings on the PGA Tour their swings are simple and effortless. And one key to doing that is what they do with their head. On the backswing their head remains pretty steady, and then just past impact their head moves towards the target so it ends up over their left leg. Stacked if you will. b) why they swing with pain. If you experience pain when you swing, I guarantee that if you reduce your head movement in your swing then your pain will decrease. Another thing you can do, is video your swing and look for areas where you think there is too much movement. Look, there’s no perfect swing but if you see yourself using way too much knee action, then reduce it. If you see yourself ducking and diving with your upper body, then reduce it. The simpler you can make your swing, the better it will be for you long term. I see all the time golfers making quite a nice move in the backswing, and then… they keep on going! They let the wrists collapse and the club drop at the top of the swing in an attempt to swing longer. There’s a couple of big problems with doing that. 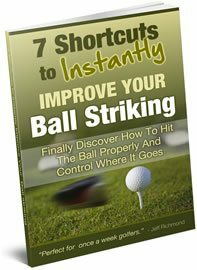 The first is that you’re costing yourself distance, because you will not hit the ball in the center of the clubface as much as you would if you stopped your swing short. On tour it’s common to see swings shorter than parallel. But in amateur golfers games it’s NOT common to see swings shorter than parallel. 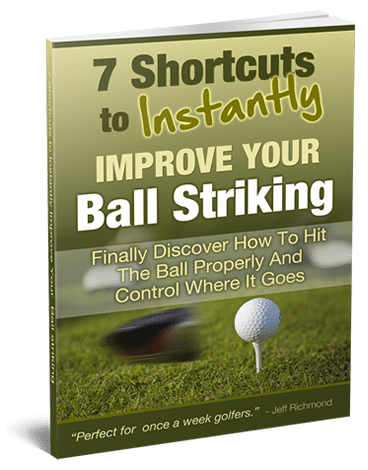 Golfers are often trying to swing longer in an attempt for more distance, and end up giving up distance because of a lack of hitting the sweet spot. Another big problem with over swinging is that it causes undue stress on your body. Eventually this will wear your body down and lead to an injury of some sort, whether it’s back pain, knee pain, wrist pain etc. If you want longevity in the game most golfers would do well to swing shorter and simpler. Again, this will show up if you video your swing. So if you see yourself collapsing at the top, I want you to video yourself swinging back with what feels like a 3/4 golf swing. When you do that you’ll be shocked at how long your 3/4 swing actually is. But you’ll also be pleasantly surprised by how good you hit the ball too. So many golfers feel pain and instead of trying to cure it, they will take something that will mask the pain so they can get through the round. Doing this is natural, but it’s not good for your health long term. Instead, golfers should be looking for the solution. So instead of going to the doctor to get some potentially dangerous drug, what about going to a physical therapist and getting on a program to try to fix the problem. And instead of taking some potentially dangerous drug, what about taking some supplements that help you ease your joint pain. You may already be taking some joint supplement, but I bet it doesn’t have the special secret ingredient that they talk about on this page. And if you’re struggling with joint and back pain, I highly recommend you check out what they say on this page; because it just might be the cure you’ve been looking for.